Famous across the world and cherished from thousands of visitors every year, the island of Santorini became a world known destination for the impressive caldera views, the black sandy beaches and the delicious products! 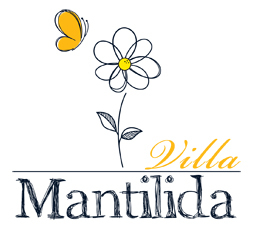 Mantilida Villa is located in the village of Emporio, in the heart of the traditional part of the village. With a unique environment, a mysterious aura and plenty of things to do, holidays in Emporio of Santorini are an experience to be lived and enjoyed! Emporio is the biggest village of Santorini conveniently located almost in the centre of the island. The village has plenty of choices for food and drink and is very close to Santorini’s most famous beaches. Access from the port and the airport is easy and is just 10 km away from the capital of the island Fira. Emporio is home to some of the most important churches of the island. The church of Agios Nikolaos Marmaritis is built on the entrance of the village on the same location of an ancient temple. The 16th century Panagia Mesani church with an impressive fully restoredtemple and a beautiful steeple is also a must visit while staying in Mantilida Villa. Emporio village has a beautiful view to the Gavrilo’s cliff with its 8 traditional Windmills standing up impressively on the cliff’s ridge. Bizantine ruins, vineyards and the scattered windmills built during the 19th century and overlooking the Aegean Sea,make a unique set for long quiet walks during hot summer afternoons. The village of Emporio is one of the five castle cities built on the island during the 16thcentury and the best preserved one. 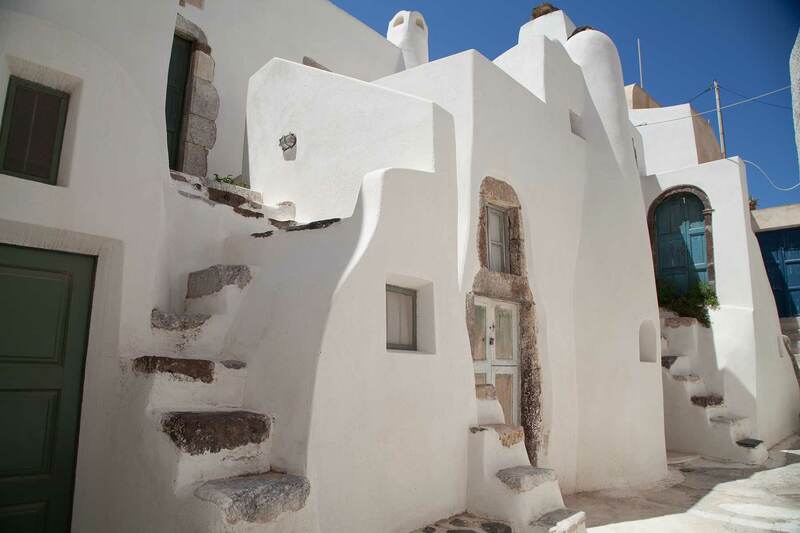 The Kasteli of Emporio is a true masterpiece in terms of architecture,a small labyrinth, with alleys just wide enough for a person to go by between staircases climbing almost vertically up to miniature balconies. There are doors seeming to lead nowhere, overhead bridges between houses, arches, domes –all characterized by the renowned plasticity of the malleable volcanic material. The irregular, flowing shapes and forms are astonishing. , The nearby Goulas was the fortified tower used for crop storage and defensive reasons. Walks at the unique castle’s roads is a must do while staying in Mantilida Villa. The organized and cosmopolitan beaches of Perivolos and Perissa are within a couple of kilometers distance from Mantilida Villa. Whether you are looking for a fully organized beach with trendy beach bars, traditional or modern restaurants, water sports or just a free and quiet beach to lie whilst enjoying the sun and the crystal clear sea of the EU Blue Flag Awarded beach, here you will find everything you are looking for your summer holidays in Santorini. Vlychada, with the spectacular lunar like scenery, the volcanic rocks and a magical sunset view (especially in September), is another nearby beach that one must visit whilestaying in Mantilida Villa in Emporio.